This is the first Full Moon following September’s Harvest Moon. It rises just after sunset and sets around sunrise, so this is the only night in the month when the Moon is in the sky all night long. Each month, we will explain the traditional names of the full Moon along with some fascinating Moon facts. In this video, learn about the Full Hunter’s Moon. Click below to watch the video. The Moon passes above Venus on October 3, to the right of Saturn on the 5th, and above Mars on the 7th and 8th. There will be another Full Moon, October 8, 2014 at 3:50 A.M. Las Vegas time. *Depending on the source and geographical location the full moon on November 2, 2009 is called one or more of the following: Full Beaver Moon, Full Hunters Moon or Heading to Winter Moon. 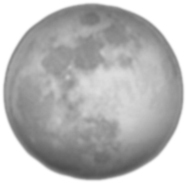 The full moon on November 2 will be 100% full at 11:15 P.M. Las Vegas time. Here is Western Washington University’s list of Native American Full Moon names. The [c.2009-Adobe Moon in the City] poster is available for purchase. The full moon in this poster was photographed in Las Vegas in the 90s. The image was inserted into it’s “frame” with a Photoshop type application. The poster is 24″x36″.